Even at extremely low concentrations aquatic life will be harmed by ammonia. Ammonia occurs naturally in the environment. A small amount of ammonia is generated when lightning strikes and reaches earth in rainfall. But most ammonia is produced by bacteria in water and soil as an end product of plant and animal waste decomposition. It is found in relatively low nontoxic concentrations in soil, air, and water and provides a source of nitrogen for plants. In soils and water ammonia will go through many complex biochemical transformations. These transformations constitute what is commonly known as the nitrogen cycle. 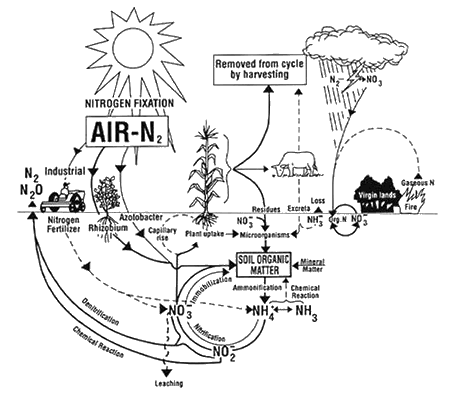 For a more in-depth discussion of the nitrogen cycle see related links. If ammonia is directly spilled into surface water or if water used by a fire department to depress an ammonia vapor cloud is allowed to reach surface water, aquatic life can be harmed. Even at a concentration of 0.02 mg/L (48 hour LC50) unionized ammonia is lethal to some sensitive freshwater fish. That equates to about ½ a cup of unionized ammonia in one million gallons of water. Ammonia is also highly toxic to freshwater invertebrates having a 48-hour LC50 of 0.66 mg/L for Daphnia magna . Again, water contaminated with fertilizer ammonia should not be allowed to enter any storm drains, rivers, drainage ditches, wetlands or lakes. After a release of ammonia the vapors will dissipate reacting with the moisture in the air to form ammonium and eventually return to earth in rainfall. Ammonium then quickly binds to the negatively charged soil organic matter and soil clays. Ammonium rarely accumulates in soil because bacteria will rapidly convert the ammonium that is not taken up by plant roots into nitrates (nitrification). Nitrates can also be absorbed by roots or may leach through the soil profile. Since ammonium is soil bound, unless the soil is washed away by rainfall events the contamination will likely stay put horizontally but leach vertically as nitrates through the root zone. If the fire department suppresses an ammonia vapor cloud with water for a prolonged period of time the applied water may contaminate soil. In this instance the soil may require some method of remediation to prevent adverse environmental affects. Plants, trees and crops are mostly made up of water. If a large release of ammonia occurs the vapor will likely burn the leaves of nearby downwind vegetation. 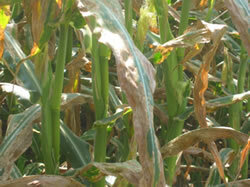 Ammonia will pull water from the leaves but will not affect the roots so damaged plants will probably fully recover although affected crops may suffer yield loss. 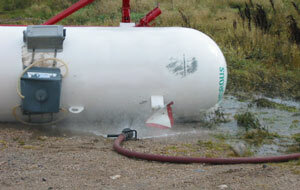 Be aware that ammonia vapors are toxic to livestock. Dairy, swine and poultry livestock producers operating near to and downwind of a release or potential release must be notified to take appropriate action. What is LD50 or LC50?